China’s hard landing is the catastrophe that wasn’t. A return to expansion in the closely watched official survey of purchasing managers released on Nov. 1 leaves the Chinese economy on track for GDP growth of around 7.5 percent for 2012. 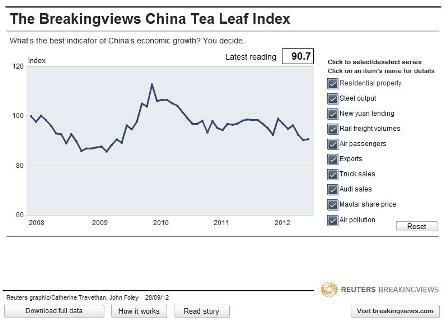 The Breakingviews Tea Leaf Index, which takes a more eclectic look at the economy, also shows that conditions are improving. But talk of a punishing downturn will recur, because China’s economy remains unbalanced. The big threat to China’s growth remains real estate, which contributes roughly 15 percent of GDP, and in reality much more, through its effects on consumer goods sales, wages and confidence. While supply exceeds demand in many cities, a flush of new credit has kept projects running. That has happened largely off banks’ balance sheets: loans made via trust companies, for example, increased by 63 percent from August to September. A hard landing is thus unlikely, but the slowdown remains real. Rail freight fell for the fourth month in September, year on year, albeit not yet approaching the seven-month slump seen at the height of the 2008 economic slowdown. Employment, a key indicator because of its perceived links to social unrest, continued to contract in the official PMI index. HSBC found that ten percent of respondents to its own PMI have fewer staff than in the previous month. No wonder graduates are clamouring for the stability of civil service jobs. China’s economy will continue to attract extreme negative predictions, because it remains too reliant on volatile investment and exports. Consumption might be growing, but needs to grow faster than other components of GDP for a long period in order to catch up. Retail sales expanded at an annualized 19 percent in September, month on month, but investment in fixed assets grew 21 percent. In fact, there’s little evidence China has rebalanced at all. The yuan is still weaker than it should be: in real terms, it has depreciated 4 percent from its April high, according to JPMorgan data. Inputs like oil and water are around 30 percent below their equilibrium price, according to a Deutsche Bank estimate, which equates to a subsidy for heavy industry, at the expense of consumers. While these imbalances persist, talk of hard landings is bound to recur. What's the best gauge of China's growth? You pick. China’s economy returned to growth in October according to the country’s official Purchasing Managers’ Index, which hit 50.2 for the month. A figure above 50 is indicative of expansion, and the previous two months had been below that level. Employment and raw material inventories continued to contract, according to the survey, but both registered improvements on the previous month. The reading for small businesses was 47.2 percent, though that still marked a 0.5 point increase on the previous month. An alternative PMI index from HSBC showed a 49.5 reading, compared with 47.9 the previous month, rounding off a full year of monthly deteriorations in operating conditions. Almost ten percent of respondents reported fewer staff than the previous month. The Breakingviews Tea Leaf Index, a composite of various alternative economic indicators from Audi sales to exports and Beijing air quality, picked up from 90.7 to 92.1 in September.